In 1870 the Maharaja of Vijanagaram first floated the idea of starting a Medical College in Lucknow. But the idea was watered down due to paucity of funds. In 1905 the visit of King-Emperor, George V, then Prince of Wales, inspired the idea of establishing a college to commemorate the occasion. The originator of this fine ideal to commemorate the occasion was late Raja Sir Tassadnq Rasul Khan of Jehangirabad to whom Sir Harcourt Butler wrote on 1st December 1905. "It must ever be a source of pride to you to think that the first suggestion of such a movement came from you absolutely spontaneously." On 22nd March 1906, the Secretary to Govt. U.P. 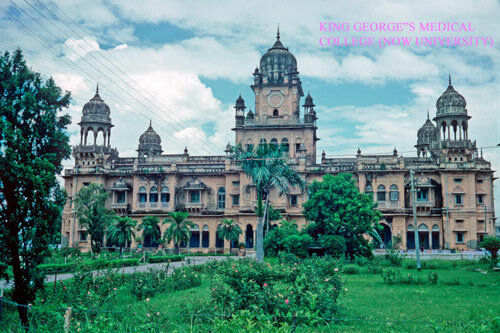 wrote to the Registrar, Allahabad University "It is the desire of subscribers to the Foundation of King George's Medical College that this College should be the best in the East and it will be aim of Government that the College shall give to its students the best education possible." The project was warmly taken up by all and the Taluqdars and Zamindars of Agra and Oudh gave princely donations. Sir Harcourt Butler himself was largely responsible for rapid maturation of the scheme by the energy in collecting subscriptions and by his talents in organisation. A picture of the Prince & Princess of Wales with eminent citizens of Oudh at the Foundation Ceremony of the college. The success of this great project of medical education and relief was already assured when the foundation stone was laid by His Royal Highness the Prince of Wales in 1906, and during his second visit for the Coronation Durbar as King Emperor, His Majesty was pleased to give his consent and to designate the College by his name. The College was completed and the work of the first medical session was started in October 1911, though the ceremonial opening of the college building by His Honour Sir John Prescot Hewett did not occur until January 27, 1912. The College buildings consisted of a fine Administrative Block, an Anatomical block, a combined Pathological and Physiological block and a Medico-Legal Department. As soon as the College was completed the construction of the Hospital itself was commenced. The work for Out-patient Department was finished by. April 1913 and the main-building a few months later. The number of beds provided was 232 and besides the main Hospital block there were an Isolation Block and separated Cottage wards. The formal opening of King George's Hospital with the opening of the New Bridge over the river Gomti River opposite the Hospital was performed in January 1914 by His Excellency the Viceroy Lord Hardinge; the Bridge took the place of an ancient bridge built by King Asaf-ud-Daulah in 1780 and which was only demolished as late as 1911-12. The architect of the buildings was Sir Swinton Jacob and the features were designed in the Indo-Saracenic style to be in keeping with ancient and royal buildings of this capital of Oudh and with the Imambara or Tomb of Nawab Asaf-ud-Daulah, which stands immediately besides the College and which dates from 1784. The total cost of the Hospital and College building was about 30 lakhs of rupees; the Local Government was indebted to the Government of India for a contribution of 10 lakhs towards the cost. The staff of the College and Hospital began with an irreducible minimum of members, and schemes for expansion were being considered from the start, when the Great War supervened. The first batch of students qualified in 1916, and these also and the next few succeeding batches were for the most part absorbed by military requirement, and only after 1920 could the College be said to be gradually returning to its normal and progressive condition. A change took place in the control of the Medical College and Hospital in 1921 when these institutions were transferred to the new Lucknow University and ceased to be directly under the Government of the United Provinces. Hither-to the College had been affiliated to the Allahabad University. For the first time in 1922 the degrees granted to the successful students was the M.B.B.S. Lucknow instead of the M.B.B.S. Allahabad, as hitherto. Since 1922, the College and Hospital has expanded in several directions. A comprehensive museum of microscopic and macroscopic. Pathology has been created, an X-Ray and Electro-therapeutic Section for Hospital out-patients were opened in 1928. A new building housing the Pharmacological departmental with its laboratories and museum and containing a fine clinical theatre was completed in 1927 at a cost of Rs. 55,000/=	' It 1926, a Provincial Pathology scheme was introduced where by the College Pathology Department was linked up with the various Civil Hospitals throughout the Provinces which were thus enabled to obtain certain diagnostic tests, if they so desired. In the realm of Preventive Medicine advance too has been very considerable. The University decided to give a D.P.H., which was formerly a Diploma which has been granted for some years by the State Board of Medical examination. A fine Provincial Hygiene Institute complete with lecture theatre, museum, laboratories and facilities for research at a cost of Rs. 3, 36,000 built by Government was opened by H.E. Sir Malcolm Hailey, Governor of these Provinces, in December 1928. This institute could train a class of 20 D.P.H. students, in addition to those trained for the examination of the State Board, 75 students for the Sanitary Inspectors Certificates, and a class of Lady Health Visitors. From 1st April 1929, Government transferred the asylum for lepers, which had been endowed by King Nasir-ud-din Hyder, who reigned in Oudh from 1827-1837, to the administration of the Medical College. The Queen Mary's Hospital for women and children was opened in 1932 when the Govt. completed the building of this Hospital at a cost of Rs. 2, 67,603 and handed over to the University. In March 1921 the College along with the Hospital was incorporated in the Lucknow University and was being managed as Constituent College by the Executive Council of the University through a Board of Management. The extension to and revision of the museum of Pathology after a period of 15 years work was completed in October 1937. The building for a separate T.B. Hospital was completed and handed over to the King George's Hospital on March 15, 1935, which finally got converted into the Tuberculosis Department in 1946. In the immediate post Independence phase the Departments of Orthopaedic Surgery and (ENT) Oto-Rhino Laryangology were established in 1951 and the first M.D. degree in Forensic Medicine in India was awarded. A separate building of Medical Ward with the bed strength of 144 was started in 1952. In 1955 Pathology got a new building. A separate building of the Children Hospital was completed in 1956, the independent Department of Paediatrics started in 1960 and MD Paediatrics in 1962. In 1961, Social and Preventive Medicine Department was born. Departments of Psychiatry, Neurology and Cardiology are the gifts of the seventies. A unit of Plastic Surgery was created in 1962 and by 1966 the Department of Plastic Surgery had started it’s residency program - one of the first in India to do so. Micro-biology, Biochemistry, Physical Medicine and Rehabilitation and Hospital Administration are the gifts of the 80' s and Neuro-Surgery and the Institute of Clinical Epidemology are the gifts of 90's. Several budding specialities like Neonatology unit, Paediatric intensive care unit, Oncology, Endocrinology, Nephrology, Urology, Thorsic Surgery, provided highly specialised care to patients in Hospital. Finally following departments were carved out of the Department of Surgery at the fag end on nineteenth century. The Dental Faculty of the college was born as a separate section of the Department of Surgery in 1949 with 10 admissions to the B.D.S. course. It was converted into a separate Department in 1950, had a new building in 1952, started post-graduate training courses in 1964, had another new building and attained the status of a separate Faculty in 1980. At present it consists of 7 departments viz Oral Pathology, Prosthodontics, Operative Dentistry, Orthodontics. Periodontics, Pedodontics and Oral Surgery. A post of Dean of Dental Faculty was created which rotates amongst the Professors at an interval of three years. K.G. Medical College has contributed immensely in the education and training of thousands of graduate and post-graduates who have brought glory and laurels to their Alma mater by the academic and professional excellence. On 16th September 2002 an Act was passed by the Government of Uttar Pradesh resulting in a major milestone in change in the history of the institution in converting and upgrading it as Chhatrapati Shahuji Maharaj Medical University. On the demand of the general public and more than 40,000 Georgians the world over, teachers and students of the University, the Government of Uttar Pradesh in the last week of October 2003 decided to revert the name of the medical university from C.S.M. Medical University to K.G. Medical University.